This is a late post. I've been meaning to post this a few days ago and when I had the time the internet was too slow. It's a bit faster now thank God. Hubby and I spent our Christmas in Baguio, our third since we came back here in my homeland. We went there on the 21st traveling by passenger bus. We spent five days there and came back in the lowland on the 26th. Baguio was so crowded. There were lots of tourist there this time of the year. It's still cool there but when we went to SM, my gosh that place was so crowded. We only ate there on the 22nd and after window shopping in the department store I felt hot and dizzy. We went to get a taxi and went to the public market instead and bought some fish and veggies. On Christmas eve, Glo and family were the ones who prepared for our Noche Buena. They ordered cake and pancit palabok from Tea House, fried chicken from KFC and she made macaroni salad and bought carrot cake and empanada. I bought Spanish bread and pandecoco. At 12 midnight, George had a short devotion about the birth of Christ and after that we ate the foods that were prepared on the table. Next was the giving of gifts and picture taking of course. I went to bed around 2 AM that night. Happy birthday Jesus! Our church had our Christmas celebration yesterday. We were supposed to start the program at 10 PM but it ended up at 10:45. Hubby said we were so late. I was so busy preparing all the gifts, wrapping and everything. It's a good thing one of my relative was incharge of the cooking of our lunch. We had chicken adobo, bottle gourd squash, rice, bananas and orange juice for all of us. All expenses were courtesy of our church fund. Hubby and I prepared gifts for the kids and also for the mothers. We decided to give some chips for the kids and a bag of groceries for the mothers. We started the program by singing Christmas songs. Then some kids sang a special song The Little Drummer Boy in front. The mothers did a duet Christmas In Our Hearts and then 4 moms rendered a couple of Christmas songs. I also sang Whispering Hope though my voice was not great. It was all for Jesus because we were celebrating His birth. Then we ate our lunch that was prepared by uncle Rudy who was in-charge of the cooking of our lunch. We had chicken adobo, bottle gourd squash, rice, bananas and orange juice for all of us. The expenses were from our church fund but the rice was courtesy of uncle Rudy. After lunch, we had the parlor games played outside which were joined by the kids and adults. I was the one in-charge of the parlor games too. I let the the kids play first the "Fanning the Fan" and then the adults. That was a fun game and both the kids and adults enjoyed it. Then the kids played the all time favorite "Trip To Jesrusalem" followed by "The Hot Item" Then we went inside and the kids had the Memory Verse contest. There were 5 kids who competed and the 8 year old Melissa won 1st prize. She was able to recite 30 verses. The 2nd prize went to 10 year old Dominica who was able to recite 15 Memory verses followed by Aiza who won 3rd prize who recited 14 verses, then Joebelle and Freddie won consolation prizes. I gave them cash prizes each, P70, 50, 40 and 20 respectively. Then I distributed the gifts to each of the kids whose were present and the they were all 31 of them. Next hubby and I gave away the bag of groceries to the mothers who were there. We prepared a total of 13 bag of groceries for each families in our church. I've seen how happy those families were upon receiving their bag of groceries. I know it help them out because most of them come from a poor family. Three years ago, hubby and I together with my step-daughter and her family went to Traders' Village in Grand Prairie to shop. It was an hour drive from our place. There were lots of shoppers and merchants there and they sell all kinds of products ranging from clothes, furniture, groceries, vegetables, fruits and a lot of more. The reason I love going there is that there were trade show displays worth seeing and the price there is a lot cheaper than in the malls or stores. In fact, that place was so crowded and most merchants there are Mexicans. Our grandson call that place Little Mexico, lol! We roamed around the place and I’ve seen a lot of gadgets like cellphones, MP3 players, etc. on a table top display in some of the market stalls there. There were also a lot of shirts on sale with Texas prints in it so I bought some and sent it to my siblings in my homeland. They were cheap. I bought 3 shirts for 10 bucks. Not bad at all. I’ve also seen some table covers on sale there and I thought it would be nice for our church to have that and use it during our fellowship, meetings and special occasions. They can be printed in rich colors and we can add our church logo. It's really cool! There were directors chairs on display that were made of hardwood. They were used for seating because logos can be silk screened onto them. It could be used in the house too specially in the patio. We can sit there while drinking coffee on a lazy day. We went from one stall to another and we feasted our eyes looking at the merchants’ displays. We ended up buying a few stuffs and it's good hubby was with me because I can't carry it alone. Today my hubby and I together with my 2 nieces and my youngest brother went to the mall. The main purpose was to buy a new cellphone for hubby because his cellphone quit working. We bought a cherry mobile cellphone with a very reasonable price. Hubby can use it also for facebook and e-mail. Hubby is not very particular with other features as long as he can call or send and receive text messages then it's fine with him. I was the one who picked the cellphone that he bought. Then we went to buy some groceries and after that we went to eat to the newly opened restaurant inside the mall called Panaderia Antonio Bakeshop and Restaurant. It was our first time to try their foods there. I ordered spaghetti with toasted bread and chicken for the two girls, sizzling burger with veggies, mash potatoes with gravy and rice for me. Hubby ordered polloslab chicken with rice and veggies and my brother got a chicken barbeque with rice. We just ordered water because they didn't have ice tea. I sent my brother to buy us some ice tea in the grocery which is just behind the restaurant. When our foods were served, I said wow! The foods look delicious and yummy. When I tasted it, it was so good! Hubby said he got so full after the meal. It's all worth it. We will surely eat there again and taste the other menus. Well, it was my hubby's birthday yesterday, the 10th of November. We went to have lunch at Shakey's and we used his Shakey's pizzanatic supercard. One of the benefits of the card is they give a free large pepperoni pizza on your birthday and 10% discount for your orders. So we got the free pizza and we ordered our lunch. As usual, hubby ordered his favorite supper platter with bottomless iced tea and I ordered the half hero sandwich with fried chicken and veggie salad. We also ordered 2 family size manager's choice, and Hawaiian delight pizza. So we had 3 pizza pies including the freebie. Too much for the two of us? Of course not, we didn't eat that for lunch. It was to go for our family. When our orders came, I asked the waitress to take our photos. She obliged and then we ate our foods. I like the hero sandwich and I my hubby enjoyed his platter. My hubby, Vernice and I went to eat at KFC in SM Baguio last Thursday. As usual, hubby ordered the tower burger, fully loaded meal while I got the twister with fish and drink while I got the sponge bob box meal for Vernice. Hubby is addicted with that tower burger at KFC. That was the 3rd time that he ordered that and he's loves KFC now better than Jollibee. His favorite in Jollibee is the Champ burger sandwich. It's a huge burger and he likes it. Vernice likes it at Jollibee but it's always busy there and hubby don't like to wait that long so went to KFC. It's a good thing that it's just next door to Jollibee there at SM Baguio. It didn't take long to wait and we got our foods. As usual, I took some pics while we eat. Vernice kept requesting me to take her photos. That girl loves to have her photos taken. After we ate, we took Vernice next door to have her photos taken with Jollibee. She was so happy when she's seen Jabi, that's what she call him. She even hug Jabi and of course hubby and I had to pose with her and Jabi too, he-he! We suddenly became kids at heart again posing with Jabi, lol! Hubby and I went walking around the town plaza early this morning. I was the one who asked him to go out walking because it's been a good while since we did it. Hubby needs to lose a lot of weight because he gained some pounds since we arrived here in my homeland. He's been lazy doing some exercise so I urged him to start walking again. We walked for 20 minutes and went back home. That's for a start and we hope to do it regularly now since the weather is getting cooler in the morning. So we started a ministry for the Lord more than two years ago. Hubby gave up his job and we sold our properties in Texas and came here in my homeland as missionaries. Our sending church is the only support we get because we didn't have time to raise some support from other churches. Since we were here and doing what we were called for, the enemy is also working double time. There were times that he put discouragement on us especially my husband but we didn't give up. We kept on keeping on. My husband and I were hospitalized and our savings were depleted but I thank God He didn't leave us nor forsake us. The rent in our house in the states had stopped because my step daughter who is buying that house was laid off from work since February. Hubby and I live a very frugal life here. Our old car needed to be fixed and it took us a while to take it to the mechanic shop because of lack of money. Hubby wanted to buy a more dependable van for us but can't afford it. He said he wanted to get rid of our junky car and get a van instead but no money for that yet. I keep praying to God to sustain us and provide our needs. Then a few months ago, the PR in my other blogs went up and I got a lot of tasks for a couple of months now. The payments I get from blogging helped us. Though it's not a lot but it's a lot more than what my brother is making from his job. I am so thankful to Blogsvertise for all the tasks, grab bags and of course the payments they are sending to me. It has helped us a lot. I know I owe it to the Lord. We just have to trust Him completely. His promises in the Bible are true and we just kept trusting in Him and claim His promises. God is good all the time! We had a good lunch yesterday at KFC. Hubby, Vernice and I drove there because we didn't cook for lunch and beside, hubby had been wanting to eat some burgers. Hubby ordered the tower burger meal which is consisted of chicken burger, fried chicken legs, fries and iced tea while I ordered the chicken burger meal with fries and iced tea and spaghetti for Vernice. I can say that KFC's chicken burgers and fried chicken are better than Jollibee's. Hubby ate all his foods and so with Vernice and I. We like the foods at KFC and we will definitely go back there again. We only go to Jollibee for Vernice's sake because she like the bee statue! It's been raining here for a three days now due to typhoon Pedring. It was signal number 3 here and classes and government offices were suspended. We experienced strong winds and heavy rain and I was watching in the news that many areas in other places were flooded and trees fell down. Some people also lost their lives. I was so thankful that despite the raging wind, there were mo major damages here in our town, praise God. Weather men were expecting the typhoon to leave tonight but there is another one coming in. It was said that there are 6 more typhoons to come before the year ends. Please God, spare us from the typhoon. It's our wedding anniversary today. It's Sunday and at first I planned to celebrate it in our church but the problem is who will cook for all those people. Besides we are short of money so we decided to just make it simple. Hubby and I celebrated it simply with my family here. I asked my brother to cook arroz caldo for lunch. That's what we ate when we got home from church. I also made macaroni fruit salad last night. I also asked my brother to cook pancit for snacks and that's what he's doing right now. We still have the macaroni fruit salad from lunch. It's our 9 years anniversary and I thank God for all the things that He has done in our lives. I asked the Lord to give us more anniversaries to come so we can serve Him longer. It's early in the morning around 4 AM when I woke up to pee but was unable to go back to sleep. I kept tossing in our bed so I just decided to get up and open my desktop. A lot of things were in my mind. I keep remembering my late sister. There's never been a day that I don't think about her. It was September 27 last year when the Lord called her home. It really made me sad to think that she's not here with us no more. I really miss her a lot. Until now, I haven't fully recovered yet from her death. Her memories are still fresh in my mind. There were times that I cry and my husband had seen me many times and he comforted me. I love my sister so much and every time I go to their house, the memories will flash over and over in my mind. I know my 2 nephews and their dad miss my sister so much. I do too. Congratulations! U have won php.380k+Starex Van, ur sim#. 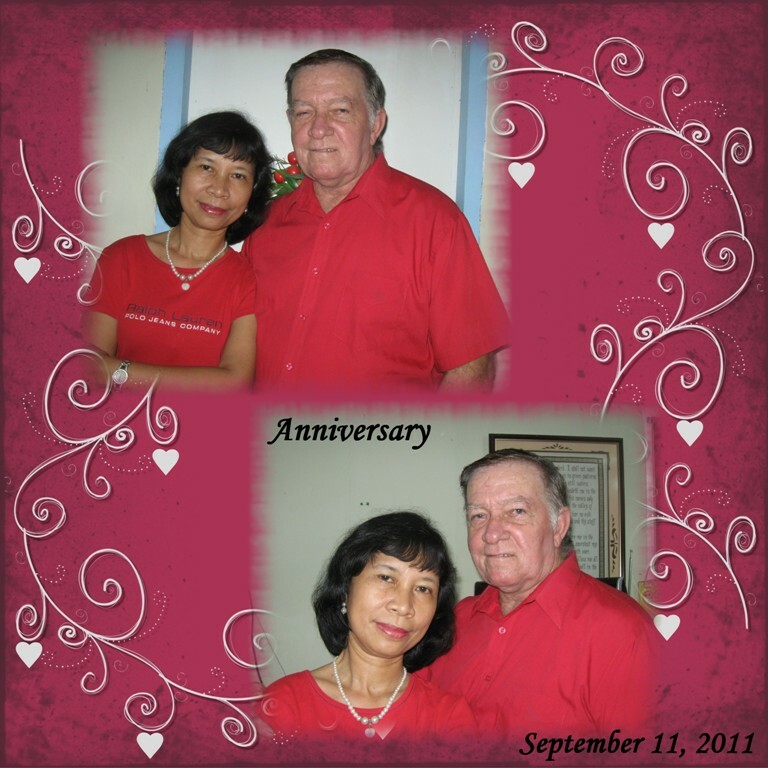 As a homepartner last June 21, 2011 for info. Call ds #.09323266283 Dir. Thomas Y. Perez of Phil.Com.Center. I called the number and asked if that is true. He said it is because my phone number was randomly picked and has won in their raffle. He asked me what's my job and I told him I don't have. His voice sounded like he's a radio announcer or something. He then told me to text him my complete name and address which I did and then call him after 10 minutes because they will have to verify my number. I asked him who I was talking with and he told me he is Director Thomas Y. Perez of Philippine Communication Center. My brother told me it might be a scam so I googled the name and it led me to a lot of text messages fraud in the Philippines and I also found the same text message with the same name and number. Those who responded to their messages were told to send money to process their winning. I didn't call the man back and it's good I found this out so I am writing it here in my blog. This has been going on for a few years already and I wonder how many people have been fooled. If you receive the same message, then don't believe it. This is a group of syndicate trying to fool people to get their money. This need to be stopped! Last Friday, my youngest brother and I drove my tricycle and we went to the bank to pick up the money sent by our friend for our church ministry. I am so thankful that there are people who have the heart to help the work of the Lord. I just wish and pray that more people would be like my friend and her husband who would be willing to help our ministry financially. Any ministry won't function without financial aid from its members and other concern Christians. We went to SM to eat lunch afterwards. My hubby didn't go with us because he decided to stay home and baby sit Vernice. In a way it's better because I can take my time going to the mall and buy things that I want without rushing. Whenever hubby is with me, he's always in a hurry and don't want to wait. So after my brother and I ate lunch, we went to the grocery and buy what we need. I even asked him to take photos of me in the mall. Me and my camera, lol! Then we went upstairs to renew my SM Advantage card. It was already past 3:30 PM when we went out of the mall and it took an hour drive to go home. Thank God for Another Year! Well, I just turned a year older last Friday. I really thank God for giving me another year in my life. I owe everything to Him and without Him I am nothing. I celebrated my natal day with my family, friends and church members. My youngest brother came to help me prepare the veggies for pancit and auntie Lita came to help me prepare and cook the bilu-bilo. I cooked beef adobo and Hokkaido mackerel with pechay for lunch. Uncle Rudy came to cook the pancit after lunch. I cooked maja blanca the night before and I put it in refrigerator. I ordered 50 pcs of special puto from Manaoag. I invited the people from our church for a snacks at 3:00 PM. They came at 4 PM because they were waiting for a ride. So we served the snacks, all Filipino foods. It reminded me when I was kid that every time there was a birthday party, most people served pancit, bilu-bilo, puto minus maja blanca. My hubby is already tired eating pancit and he said the puto that I ordered were not as good as my special puto that I used to cook. He loved the bilu-bilo though and the maja blanca. Two months ago, my brother-in-law asked me if I want to order green barley juice. He told me he knows somebody who is selling it. I have read about the benefits of barley before so I ordered 1 bottle which cost 300 pesos. Hubby and I have been taking it since then and I am happy to tell that the lump at the back of my right knee which was so hard has now disappeared. Also hubby's lump on his chest had flattened. It used to be hard and it hurts when I touched it. Now the pain is gone. Green barley really works not only on lumps, cysts or tumors but on different illnesses. So I ordered 1 box of green barley with 28 bottles for me and hubby. I also sell it to our neighbor who has some health issues too. Also my brother and his 3 year old girl had been taking it. If you don't like going to the doctor and take those pills with lots of side effects, then better try green barley. I tell you it works! Take it from me. Yesterday marked the 3rd birthday of my beloved niece Vernice. My brother took the day off while his wife was on her parent's house to send her brother off to Taiwan. Early in the morning yesterday, we greeted Vernice a happy birthday as soon as she woke up. We told her it's her birthday and she's turning 3. She was all smiles when I gave her her birthday present. It was a matching spaghetti shirt and shorts. My brother went to the market early yesterday and he bought some groceries to cook the celebration. He cooked pancit first for snacks and cooked the beef adobo, spicy friend chicken wings during the evening. brother's wife came home before snack time. I cooked maja blanca for dessert. Hubby bought 2 roll cakes for Vernice, mocha and chocolate flavor. The celebration is just for our family, my siblings family and we just invite a neighbor and gave her some foods to take home. 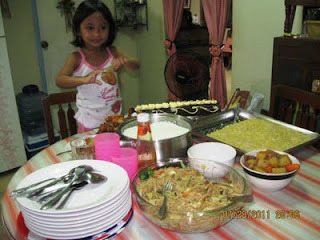 We ate pancit and the mocha roll cake for snacks at around 3:00PM and we ate the main course at dinner time. My brother had been cooking outside using firewood. I told him why not cook using the gas range but he said he wanted to save gas and besides there are still lots of fire woods out there. Vernice is so blessed to have loving parents who love her and she have me and hubby who love her as well. You can't help loving the kid, she is something else. She is a happy baby, so lovable and as hubby said she is a mess! There is nothing like a nice looking set of teeth, when compared to a not-so-nice set of teeth. We make judgments, subconsciously about new people we meet and how their teeth look. In turn, others are also factoring our teeth into the equation when they 'size us up'. Therefore, having a nice looking set of teeth is desirable. Often times, people can tell when our teeth are not real. In addition, replacement teeth can be quite expensive. Therefore, it is desirable to keep our own natural teeth. Our teeth are very important for our survival. We need to eat. We need to rend and tear our food and mix it with saliva for the rest of the digestive cycle to continue. To maintain a perfect healthy body, we need to take extra care of our teeth to have healthy teeth. If you do not take care of them and lose them, there is no get back from it. Make it a point to visit the dentist at least twice a year. Also try to make sure about the cleaning of the teeth by brushing and flossing at least twice a day. You also need to be careful about what you eat and drink. Remember, the plaque on your teeth is just waiting for that sugar to arrive. Eat lots of fruits and vegetables and drink water instead of soda. And don't forget to smile! I didn't realized it's been that long since my last post here. I have been busy updating my other blogs. I have a total of 6 blogs and sometimes I ran out of things to write. I was thinking of giving up two of my other blogs but on second thought, I think I will just update them in my free time. I have invested a lot of time in those blogs already and it makes it so hard for me to give it up. Anyways, it's raining this afternoon. This morning I asked my li'l brother to drive me to the market to buy some fish, fruits and veggies. My hubby stayed in the house to watch Vernice. I asked him if there's anything in particular that he wanted me to buy for him and he requested oranges and bananas. In the market, I bought fish first, 1 kilo of gg, then off I went to the fruit section and bought oranges and apples, also bananas and pineapples. I bought veggies like patola, okra and camote tops also onions. I also bought and 20 pcs of puto kutsinta. My brother was the one carrying all the stuffs that I bought and he decided to take them to the car. Last thing I bought were eggs and bread. Nothing was left from my 500 peso bill. Money fly away so fast. Hubby and I have been very frugal in spending these past few months because our income had decreased. We hope and pray that the rent from our house will be paid soon. We were already leaving when I suddenly remember to buy a battery for my wrist watch so li'l brother had to stop. I got out and went to the watch repairer that also sells batteries. He replaced the old battery, paid him 80 pesos and he handed my watch to me with a brand new battery. That's it and we headed home. I'm eating the kutsinta right now in between my typing. It's so yummy! I finished 4 pieces and I still want more. Well, it's been raining continuously now for four days. I've been praying for rain a week ago and here's the answer. I like rainy season because it makes the weather cooler but I don't like it continuous. I want to go out too and do shopping without worrying that I might get wet. Rain makes our plants greener and healthier. No need to water it everyday and we can save electricity but my other plants like my cacti, euphorbia and calachuchi don't like too much water. I had to move their pots to the shade which is not exposed to the rain. I don't know how long this rain will last. I hope it will stop for a while and come back again some other day. The year 2011 is already half through. It's already June and it won't be long Christmas will be here. If only I can pull the time so December will come before June, lol! I dislike the hot weather we have right now. My, this is the hottest month we have so far this year. I wish rainy season will come to replace the heat. It rained the other day but it was only short lived. Right now we are using the fan. We are limiting the use of the AC because we had a huge electric bill for the past month due to the use of AC every night. Take note, it's only during the night that we turn on the AC and maybe a couple of time during day time but we had a a huge bill already. Can't wait for the summer to pass by. Our house where we live right now is our ancestral home. This is where my siblings and I were born and grew up. When I was young, this house was very simple and small house. It has been remodeled twice. Now it's a two-storey house with 4 bedrooms. The problem is, it has only one bathroom and toilet. So when somebody is inside and I need to use it, I have to wait. Boy, that's not easy. Another thing about this house is that, the second floor is so hot during daytime because the sun's glare penetrates to the window facing west. I put curtains but it don't really block the sun. I think that Shutters are better than just using curtains. It will block the sun's rays and the heat. We have some blinds before but then they got old and need to be replaced. My brother is using blinds in their room to cover the sun rays. It keep their room cooler. Talking of shutters, I've seen some sites selling it in the internet. I haven't bought anything bulky in the internet yet. Hubby and I bought our blinds from the store many years ago. Maybe it's about time to try and order it online too. They have a wide selections of shutters or blinds for all occasions at a variety of different price points. I told myself why not try to buy blinds online. Hubby and I don't have to go out and drive to the store. Not only we can avoid the long line of people at the counter but we can also avoid the traffic not to mention saving money for gas. It was so hot today. I think today was the hottest in temperature so far. I woke up in the morning and I was already sweating around 10 AM. The first time I've been sweating this bad since I was here in my homeland. It made me feel weak. Around lunch time, I asked hubby to turn on the AC in our bedroom. I stayed there for a while until I felt refreshed. Then I had to go to the living room to watch tv because the cable tv in our room was so blurred. I had to turn on the fan in the living room while watching tv. It was so humid today. I was wondering what was the temperature so I checked online and it was 89 degree Fahrenheit but the humidity was so high, it was 71%. It was hot and humid today. Our car broke and it needed to be fixed. It overheated when hubby and I went to the grocery store last week. We took it to the shop nearby and it the mechanic found out that there are quite a few parts that need to be replaced. It is an unexpected expenses on our part and we don't have the budget right now. Hubby had to borrow money and pay it back when he gets the monthly rent from our house. My youngest brother was the one whom we asked to go and buy the parts since he has a motorcycle. It's so hard to travel without our own car. Hubby said he wants to buy a van when he has the money. Right now, we have to be contented with what we have. I'm back to my sewing hobby again. The past few days I've been sewing some of my dresses. I admit I was really so busy the past few months that I totally neglected that hobby of mine. When hubby and I were in Texas, I've sewn a few of our clothes. I was even asked by some of my church friends to alter their clothes. I made a few bucks out of it. I'm not a professional dressmaker/tailor, in fact I just learned how to sew when I was in Texas. Hubby had bought an electric sewing machine for me during my first Christmas in the US in 2003. Then I asked one of our lady church members to teach me how to use my sewing machine. She came to our house a couple of times to teach me how to operate my sewing machine and in return I cooked pancit and lumpia for her. I learned how to sew and since then I've been having fun sewing. I made throw pillow cases, skirts, blouses and altered a lot of our clothes. I didn't know that I can sew before I had my electric sewing machine. That's one f the best Christmas gift that hubby gave to me. Happy Sunday everyone! Hope everybody had a good and wonderful Lord's day! We had a good one in our church. Tomorrow, we will start our VBS with out theme Bible Boot Camp, Putting on the Armor of God. We start late this time unlike last year, we started it on April 12-16. I was busy with some other things this time due to the moving back here in our family. I already announced to the kids and also in the church about our VBS and hopefully it go on smoothly like last year. I pray that the kids would be blessed and kids will come to the saving knowledge of Jesus Christ. Happy Sunday everyone. We had Sunday School today. As usual, I taught the kids in Sunday School. We prayed, had some songs, told them stories about Jesus when He was a kid, gave them coloring activities and after that I gave them candies, chocolates and wafers. I thank the Lord that I'm able to teach again after I got sick. I praise Him for His never ending love and care to me. The adults had their Sunday School too. Then we had the worship service. Hubby preached about "We Will All Face God" and his text is found in Philippians 2:8-11. Nobody can escape judgment day, whether we like it or not . We will all give account of what we have done here on earth, how we live our life, if we had witness to other people about the getting saved and how we raised our kids, etc. Are you ready to give account to Him when that day comes. If not, now is the time to act, repent from your sins and accept Jesus Christ as your Lord and Savior. Tell others how He changed your life and took you away from the pit of sin. Tell others about Jesus and how He can save them from their sins. I really thank God for my hubby. Since I was in the hospital until now that I'm out and recovering, he's been very supportive to me. He is the one doing the laundry and he do it almost everybody. He also water the plants and feed our dog. I really appreciate all the things he's been doing and I thank God for him. He's an angel sent from above. I just want to express my great thanks to our Loving God for sparing my life a couple of weeks ago. I thought He would be calling me home last February 23rd but he didn't. He till have a great plan for me. My hubby and I have our ministry that we started 2 years ago. There are still souls to be reached out there and I'm were to carry out God's plan and do His work. Thank you Lord for being so good to me. I can't thank you enough for all the great things you have done in my life. I've been through a lot of trials but you are always there for me though sometimes fail You. You didn't give me trials beyond my endurance. I cried many times to you Lord and you heard my cry. You carried my through all the illness, pains and heartaches in this world. You are my strength and song. I love you Lord. I wanna share some email sent by my hubby. From time to time he sent me some interesting emails that are so worth reading. He it is, he-he!!! sleep every night with a hot 18-year-old girl. me that you're not holding up your side of things." watching a 10-inch black and white TV. Hubby and I had a post Valentine date last February 15th. Actually, that's the anniversary of our second wedding which was held in Texas on February 15, 2004. 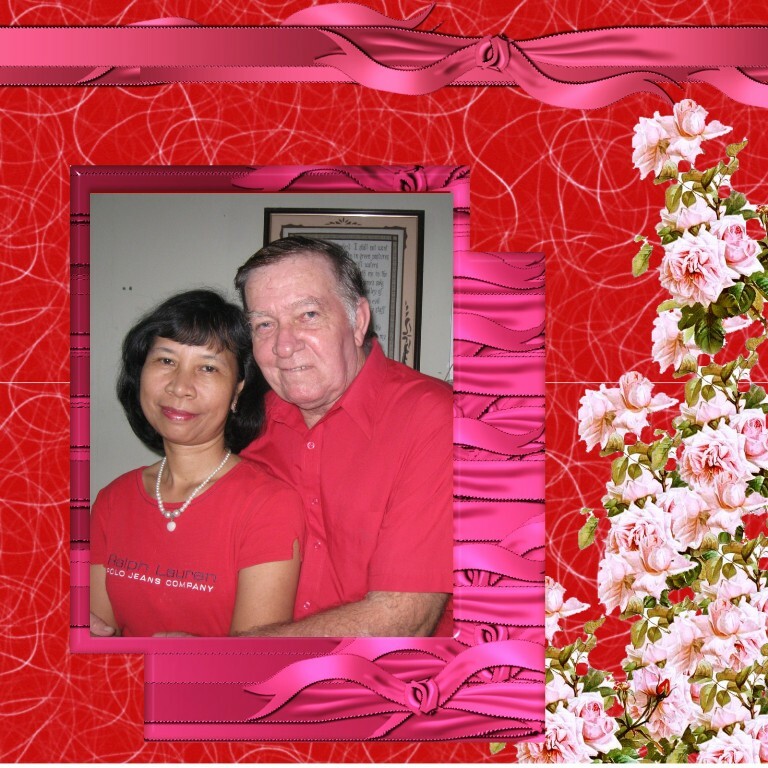 Our first wedding was held in the Philippines in September 11, 2002. It's like we celebrated Valentine's and our anniversary. We went to eat at Matutina's Seafood restaurant. The last time we ate here was 4 months ago, a day after my sister's funeral. There were many customers in that restaurant because their foods are great but kinda pricey. That's the reason we only go there once in a while. Hubby and I enjoyed the foods, he ordered roasted chicken, leche flan and iced tea while I ordered beef with ampalaya. We both enjoyed our meal. We headed to the mall and hubby let me shop for a purse and a pair of shoes. I was so ecstatic because my purse I was using that day was already chipping off. I bought it at SM the other year but it's not a quality bag. The maroon shoes I bought matches some of my skirts and dresses. I'm going to use it in going to church. Last thing we bought that day is a keyboard and speakers for our church. Happy Valentine's Day everyone! Hope everybody enjoyed this day with their loved one. Hubby and I didn't go anywhere today. We just celebrate this day at home and no grand celebration either. Hubby already bought gifts for me a couple of days ago, 2 scarves. Today he did the laundry for me and this afternoon he watered my plants. I cooked beef adobo for us during lunch and he enjoyed it though it's almost burned, lol! He said it taste good and the beef was so tender. It should be because I cooked it in the pressure cooker. Well, this is our 9th Valentine's Day since we got married. We are still together and in love with each other though sometimes we have misunderstandings too which is just normal to a married couple from 2 different cultures. My niece Vernice was in the house the whole day. We had to babysit her because her babysitter went out of town until Friday so hubby and I will babysit her for 5 days. This morning, she slept until around 10:00AM. When she woke up she ate two pancakes that my hubby cooked for breakfast. I gave her pineapple juice for her drinks. She played after she ate with me and hubby. She is so behaved when she's with us but I noticed when she's with her mom, her behavior changes. She become grumpy and wants to be held most of the time and her mom give in to her. When she's with us, we discipline her and we don't spoil her. If we say no to her, we really mean it and she obey us. Hubby and I had a good time watching her eat the camote tops that I cooked during lunch. She ate it with gusto and she ate it too fast. How she love green leafy vegetables dipped with Bragss liquid aminos and apple cider vinegar. Not too many kids love to eat vegetables. She also love sinigang soup and fish. In fact she ate a lot during lunch today. After she ate she came to me, showed me her belly and said she was so full! She came and hug me. She's so sweet and lovable and I love the way she say "I love you" to me and hubby. I bought an elliptical machine more than a week ago. I need to exercise because I noticed I'm gaining weight lately. Boy, I don't want to get fat! I can't afford to buy a new wardrobe and of course I don't like to have those love handles all over my body. Anyways, I bought the elliptical machine from my blogging money. It's a gift to myself after all those long hours sitting in front of my computer. I've been too lazy to exercise the past few months. I need to go back to my daily exercise. So far I've been liking my elliptical machine. I've been on it five times already since I bought. I like it better than my stationary bike. This morning we celebrated our church's 2nd year anniversary. I can't believe it's been that long since hubby and I started our ministry here. We had a full house this morning during our Sunday School and worship service. I was only expecting around 50 people but the attendance exceeded my expectation. We had more than 75 people who came and joined us in our celebration. In my Sunday School, I had 28 kids who were present. The adults Sunday School had a full house too. There were 4 adults who attended for the first time today. I've been inviting them many times and it's only today that they came, praise God! Jhun had a special song and he sang "This Is The Day" and it was sang beautifully. How I wish I have a good singing voice too. Hubby's message was about Praising God. After the service, we had our lunch. We bought vegetables for pinakbet and 2 goats and my uncle Rudy and 2 other relatives helped him butcher the goat. They cooked caldereta, kilawen and pinapaitan early this morning before the service. We served banana for our dessert and orange juice for the drinks. Lots of people ate and we had a blast. I hope and pray that those people who came today will continue to attend our church service from now on. Thank you Lord for blessing our ministry. We can't do it without your help. My goddaughter Aika and her siblings came over at our house last night and had dinner with us. I started to cook at 4:00 PM and I cooked the chicken afritada first. I thawed the chicken an hour earlier. I washed the chicken and then I peeled and chopped the vegetable the ingredients. Then I cooked rice. The fish sarciado was next in line. I had to fry the salmon fish first and cooked it with tomatoes and eggs. The last menu that I cooked was the goulash. At 7:00 PM our visitors arrived and I was still cooking the goulash. Whew! It was really a challenge to cook and beat the time especially I had no help except my hubby who didn't really do that much but to peel the onions and garlic. He did the dishes too that I used while preparing the foods. Anyways, it didn't take long to cook the goulash and it was time to eat. Our guests said that the food taste good. Of course because chicken afritada was a specialty of mine. I always cooked it before so I had lots of practice already. While eating we did some picture taking. Our dessert was Selecta ice cream, fruit salad flavor. Everybody got full! I started planting some vegetables in our yard. I miss my organic vegetable garden in Texas. I asked my youngest brother to get cow manure from my uncle's yard. Then I bought some vegetable seeds and tomato seedlings a week ago. I planted some of the seeds and put the manure in it. I still have to plant the rest. I watered them everyday, sometimes 2x a day. To my delight, the seeds that I planted started to sprout already. It will not be long and I will be reaping them. Can't wait. Happy new year everyone! We had a simple New Year's celebration in our house on New Year's eve with my hubby, my 2 brothers and their families and my brother-in-law with his 2 boys. It's the first time that we celebrated New Year minus my aunt and my sister. Last year, they were still with us happily celebrating and welcoming new year. Who could have known that it was their last celebration with us last year? That's life, we don't know when our heavenly Father will take us home that's why we need to be saved while there's still time. We all know that both my aunt and my sister were saved and they are now happy in heaven. As usual, we have prepared foods on New Year's eve. I made fruit salad, goulash and my brother helped in frying the chicken wings and cooked the pancit. My 2 sisters-in-law and my youngest brother helped in preparing the vegetables. My brother-in-law and his 2 boys came an hour before midnight and brought 2 big bottles of soft drinks. At midnight, my nephews and my youngest brother lighted the firecrackers and had a blast outside the house while I was busy preparing the table. We had picture taking and then it was time to eat. We were all full and then my 2 SIL did the dishes. My youngest brother and family spent the night with us and the rest went home. It's another year and I'm excited of what the Lord has in store for me to do this year. I pray that it will be a fruitful year for us and our ministry. I pray that more souls will be saved and also we can buy a land to construct our church. Lord, you know our heart's desire and I believe you will provide our need. Thank you Lord. I praise your name!